A few weeks ago, Amazon introduced the new lower priced Kindle with Special Offers . Priced at $114, it also gets special offers such as 1/2 price gift card options, $10 book credits etc. Great bargain, in my opinion, that opens up Kindle and accessible reading to even more people! The payoff is that the lower price (wifi only) is available because this particular Kindle is sponsored. Current sponsors are Buick, Visa and Olay. They place small ads on the Kindle homepage (not the books themselves!) and on the screensavers. Amazon AdMash is the new free Kindle app - available for Kindle latest generation only - that allows the Kindle community to vote of which Kindle screensavers they prefer. 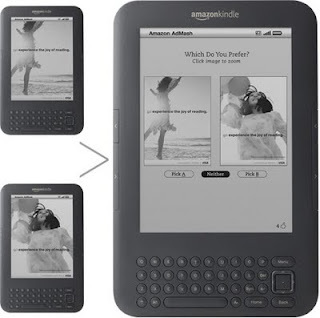 The screensavers with the most votes will be the ones shown on the new $114 Kindle with Special Offers (Kindle-SO). Not all Kindles have these sponsored ads. Kindle WiFi and Kindle WiFi+3G do NOT see ads, but can vote on them with AdMash. Only the Kindle-SO will see ads.